I resolve to give you the best NFL predictions in America. This resolution thing is easy. Last year, I resolved to eat more donuts and you know what? I did! I did eat more donuts. The key is to set realistic goals and do what everyone else does. So this year in order to give you the best NFL predictions in America, I started to actually follow the NFL. I started this week. Soon, I realized the NFL is firing everyone and the thing to do is fire my predictions coordinator. It’s his fault that I got so many games wrong last year. Therefore, I am now conducting interviews while debating in my head whether to grant total control of my predictions to just one person. The predictions coordinator has to deal with 16 games almost every week plus keep track of 32 teams and every player and coach on every team. In addition, the predictions coordinator must learn to control my fingers as I type – ten fingers, each with a mind of its own. For instance, the middle finger on each of my hands is named after a wide receiver and both seem to always want attention. And then there’s the finger pointing that went on this year whenever a prediction was wrong. Talk about a dysfunctional set of hands. Thus, I’ve applied for an early grant from the Obama infrastructure plan and I have money to hire an entire predictions staff because the incoming president has declared nothing is more important than trying to figure out whatzgonnahappen. BYE AT STEELERS – Ben Roethlisberger’s concussion leaves only one side effect: he insists he is left-handed. BYE AT TITANS – The Titans enjoy their final days as the best team in the NFL by gathering around a photo of Albert Hayesworth’s knee and singing Kumbaya. BYE AT GIANTS – The Steve Spagnuola story is the surprise hit of the Broadway season. 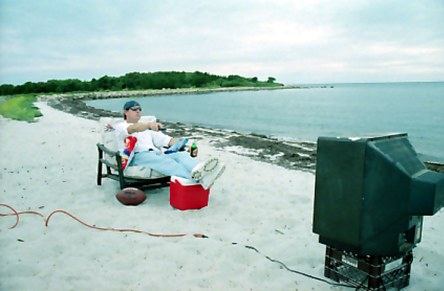 BYE AT PANTHERS – Jake Delhomme and Steve Smith toss the football around on the beach and design their next game-winning play. This column is sponsored by optimism.